MODesty August Bank Holiday Special .... SOLD OUT!!! Ah cannae go . . Try drinkin' prune juice along wi' yir grits n' groove. Grammar = the difference between knowing your s**t, and knowing you're s**t! 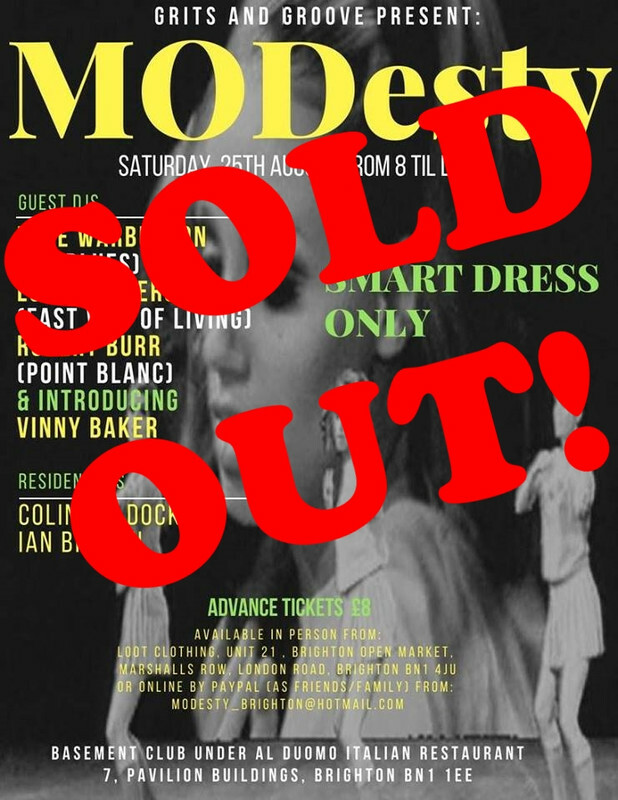 Re: MODesty August Bank Holiday Special .... SOLD OUT!!! Modesty Saturday - Where to start ? OK let's get the downside out of the way first, I can only apologise for the queues for the bar & delays getting served, and thank you all for your patience. In some ways we were a victim of our own success with the increased attendance, combined with bottled drinks being decanted into plastic glasses because people being allowed to take their drinks outside. I will be meeting with the venue management to try & find a solution. It was a pleasure and a privilege to play tunes to such a smart, sussed crowd alongside my old mate and partner in crime Colin Baldock, together with brilliant guest DJs (and friends) Lucas Gomersall, Mike Warburton, Robert Burr and Vinny Baker, who all kept the floor packed with blinding sets. A big thank you. also to the staff & management of Al Duomo Italian Restaurant and to Rocking Doug for his stirling work on the door. Sounds like a top night mate. As noted in my other post I was at Sea-Sidewinder but yours sounds like one I'd consider splitting time with next year. Fair play for your Smart Dress Code too. Glad you stood by your guns fella. Lucas is an absolute class act who I have a lot of time for and his partner Katie too. Nice one. Well, MODesty was really up my street! I just danced to Lucas and Ian but the quality of the music was absolutely brilliant. I would definitely recommend a club night like this.